I dedicate this post to everyone who has experienced anxiety at some point in their lives. How I Decided To Deal With Anxiety Naturally does not contain affiliate links or has any promotional purposes. You cannot sleep. You wake up feeling a big knot in your stomach and thinking something really terrible is about to happen. You start to panic for no reason. Your stomach hurts, and you feel like you are burning inside. You get out of bed and start walking in circles. You cannot get anything done. This is anxiety, and it is the worst feeling I have ever experienced. After my first child was born with a rare birth defect (esophageal atresia), my life changed forever. Weeks in the NICU, countless ER visits, tests, and procedures really took a toll on me. It made me a different person. It made me a chronic and obsessive worrier. I had negative thoughts all the time and started to experience anxiety everyday. During that time, I started seeing a wonderful therapist that helped me a lot with my fears and anxiety. I knew I had to get help. She helped me realize I should enjoy the present and not think so much about future complications my son could have. She also helped me understand I needed to appreciate each moment. So I started to feel positive again, and my anxiety left me alone for a while. A few years later I had a second baby. My daughter was born 100% healthy but instead of being grateful and happy, I started to feel anxious again. I started to obsess about every single little thing. I had two kids now to worry about. I felt so anxious and desperate that I went to see my doctor. In less than 10 minutes she diagnosed me with postpartum depression and gave me a prescription for antidepressants. I left her office thinking I was not going to take those medications. I was eating healthy, my kids were doing well, my husband was extremely supportive and helpful. Why was I feeling so bad? I thought my anxiety was going to go away but a few days later, my anxiety got worse.Not talking to anyone about it and just ignoring it was the worst thing to do. It got so bad that one morning I ended up in the ER with a panic attack (first one I ever had in my life). There I was panicking and thinking I was such a failure. A nurse gave me a Xanax and I knew that meant the end of breastfeeding. I felt so guilty, but at that moment I felt so weak and helpless that I took it. I gave up. The next couple of days were really depressing. There I was giving formula to my baby, trying to stop producing milk, and taking Xanax twice a day. A week later, I went back to see my doctor. She told me to take the antidepressants, and I started taking them. The first week I could not sleep, but soon afterwards, antidepressants kicked in and I felt no more anxiety. I felt nothing. As a matter of fact, I had no feelings or emotions. I could not feel happy, or sad, or cry, or laugh. But I had no more anxiety and was able to function again. After 2-3 weeks of taking the antidepressants, I woke up one morning feeling like a robot, and I decided to help myself naturally. This is How I Decided To Deal With Anxiety Naturally. I did not want to live a life without feeling anything. I did not want to depend on chemicals to be able to function. I am a huge believer in natural medicine. I saw the results with my son so I had to try and fix it for myself as well. I realized that day that I could be stronger than my anxiety. I realized I had the courage to stop the meds and deal with it naturally. I am doing great right now. I do not know if anxiety is going to come back again, but at least I know now How I Decided To Deal With Anxiety Naturally and recovered. I feel stronger and a lot more confident now. Taking long walks in the mornings. Breathing fresh air is a great way to relief my anxious feelings. Very early in the mornings, with my baby in the stroller, I would take a walk for about 30 minutes. The photo you see in this post was taken with my iPhone one morning the baby woke up really early. Thanks to my baby I was able to admire one of the most beautiful sunrises I have ever seen in my life. Talking to family and friends. A friend or family member who cares about you will listen to your problems. Talking about my anxiety helps me with my fears and concerns. Good friends and family offer great advise too. I feel it is great therapy to talk about your problems. To be heard and understood. There are thousands of people dealing with anxiety everyday. Getting professional help. Most health insurance policies now cover therapy treatments. A good therapist can help you a lot. It is great to talk to family and friends, but a professional can help you deal with your anxiety naturally too. They have the expertise and knowledge to guide you and help you recover. They can offer expert advise to treat your symptoms. Taking magnesium. I started researching about it and found out magnesium is one of the best natural relaxers. It is a fantastic mineral for anxiety, so I take magnesium now everyday. I really cannot tell you with 100% certantly that magnesium fixes my anxiety, but it for sure helps me feel calmer and sleep better. Avoiding caffeine and drinking lemon water instead. When I am feeling anxious I do not drink coffee because it makes it worse. Drink warm lemon water as soon as you wake up. Lemon water is amazing! Lemon has calming effects, it will clean your system and you feel more energized. It really works for me. Accepting the fact that I am not perfect. You cannot live a life that is perfect and you are only human. I really wanted to breastfeed my baby for at least the first year of her life and I couldn’t. I did it for four months and I did not fail as a mother. I did the best I could and have to accept the fact that I am not perfect. All I can do is try to be a little better each day. Taking it one day at a time. You cannot recover from anxiety in just one day. Take little steps each day to try and overcome it. When you have anxiety you cannot get anything done. Make a list of 2 or 3 things you would like to accomplish that day and try to do them. Feeling productive helps. 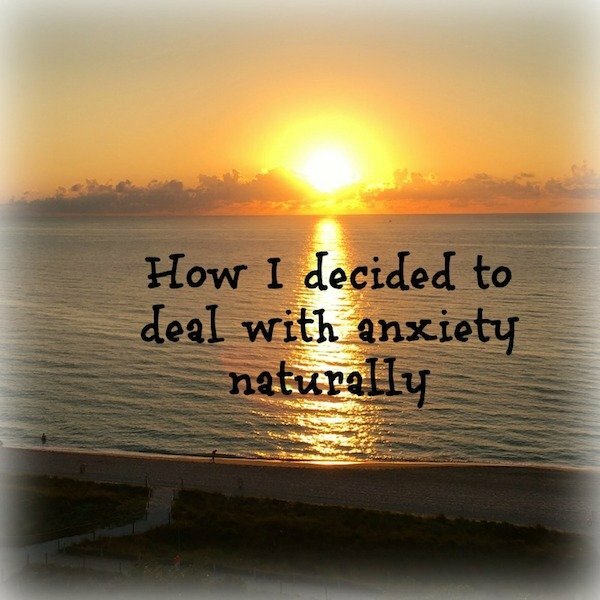 It took me a long time to write this How I Decided To Deal With Anxiety Naturally post. At first, I felt embarrassed and ashamed for having anxiety. I understand now it could happen to anyone. I hope my How I decided To Deal With Anxiety Naturally post helps you too. **UPDATE I recently found out about a wonderful supplement that can also help with anxiety. If you are interested in learning more about it, please read my post Perfect Rhodiola Rosea The Miracle Herbal Supplement. Thank you! I had forgotten how good magnesium is, your information was a good reminder I will also pass it along to family & friends that I know are suffering from anxiety. It’s called Remag and it is in liquid form. I put it in my water bottle everyday! The website has a lot of great info check it out. What kind of magnesium did/do you take? Hi Lindsay, I take Remag from this website: https://www.rnareset.com I just answered a previous comment with this information but forgot to say you can take Remag and Remyte together to better absorb the mineral. I enjoyed this post, thank you for sharing. Do you take a single magnesium supplement or a multi with magnesium? I have been researching magnesium and currently use mag oil but I’ve wondered about an oral supplement too. Thanks! Hi Tina, I use Remag and Remyte from this website: https://www.rnareset.com what i do is put it in my bottle water and drink it throughout the day. Remag is the magnesium but taking it with Remyte helps with the absorption. Thank you Allie. I am glad I can help. What a great article! I too struggle with anxiety very much, and depression ever since I gave birth to my 4 year old beautiful boy! Initially I was put on antidepressants and had the exact same experience with it you did, just horrible!! Now I have reduced on my own my full prescription to now hardly any but definitely still have anxiety and depression. Can you tell me what kind of magnesium you take? A pill or a powder? Thank you so much for this encouraging article! It’s called Remag and it is in liquid form. I put it in my water bottle everyday! The website has a lot of information on the benefits of taking magnesium. Thank you so much. I can’t believe that I have found this post – I need this tips so much . I have decided to schedule a doctor and I will follow yours advices as well. Thank you for your message. I am glad to know I can help others deal with anxiety too. Im glad you found some natural cures. But can I ask why one xanax meant the end of your breastfe eding journey? Hi, thank you for your message. When I took the xanax I couldn’t breastfeed obviously so that day I just pumped one time and threw the milk away. The following day I took another xanax and pumped just enough for my breasts not to explode;) I also saw my doctor and she prescribed the anti depressants so breastfeeding was over. Every time I remember this it makes me feel very sad.